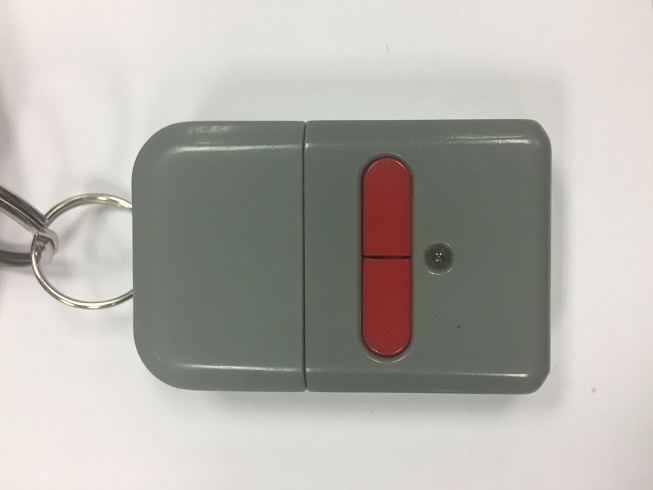 After the last two posts, I decided to build a simple PCB to handle various remotes in a single device and also serve as a "general purpose keyfob". I've built it around a PIC12F1840 microcontroller which I had handy. 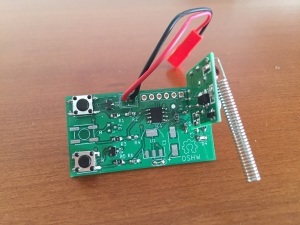 This microcontroller includes an internal oscillator so the external components were reduced to a minimum: just the radio transmitter, some push-buttons and a LED. 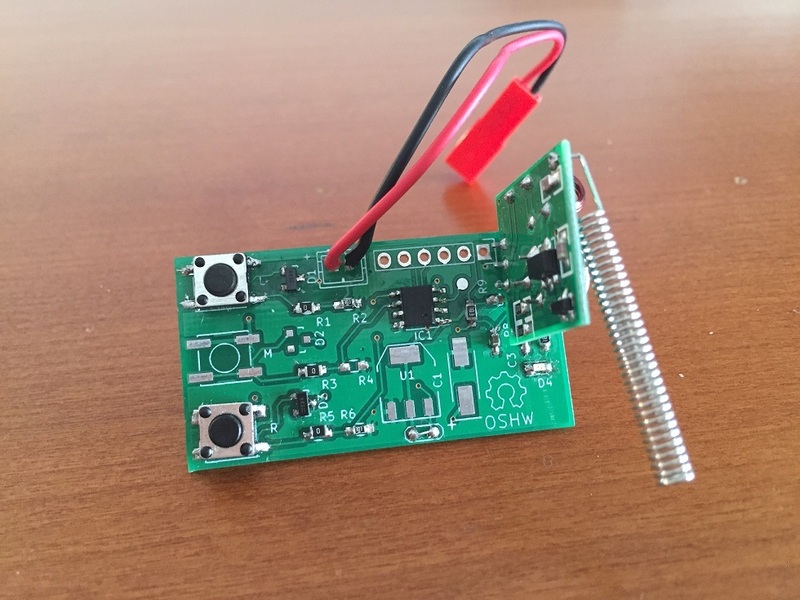 Initially, I aimed to power the board directly from a 1-cell Lipo battery (or 3 AA/AAA) but I included support for a higher voltage supply just in case the transmission power was too weak. 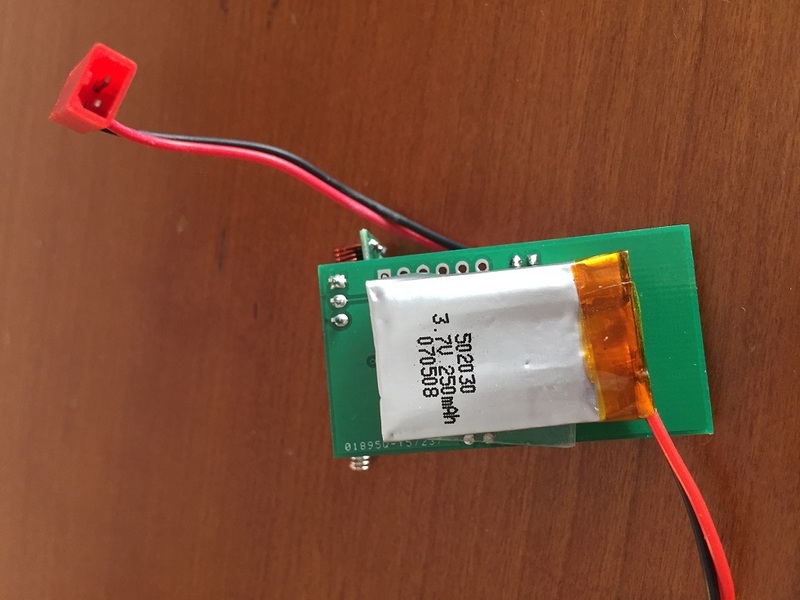 If you want to power the keyfob with a higher voltage, just solder the regulator and adjust the resistors (R1, R3 and R5) so that the PIC reads no more than VCC volts at its inputs. For my application, it works just fine with a 4.2 battery and I get around 30 meters of transmission distance. The board remains unpowered until the user presses a button. At that time, the microcontroller boots up, reads which of the button's been pressed and executes the action until released. Theoretically, a single battery should last a few years. 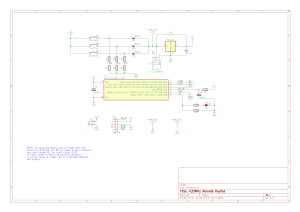 Below you can download the Kicad files so that you can modify anything, as well as the gerber files to order it your own. The transmission module can be easily found on many sites for less than $2. Below is the C code for the microcontroller that can be compiled using the free version of MPLAB IDE. It's an example of how to send a different command depending on which button is pressed by the user. After my first contact with the RTL-SDR a couple of days ago , I've been researching a bit more and found this fantastic blog post by Adam Laurie which describes how to use a TI Chronos development kit to send arbitrary sub-1GHz signals. It happens that I had such a kit so I decided to emulate another garage door opener, but this time using RFCat. 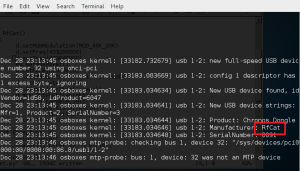 First thing I did was to flash the USB dongle with the RFCat firmware so that I could emulate the remote from a python script. 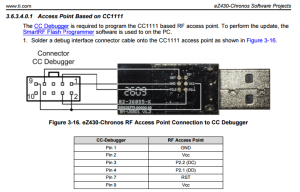 As I had a CC Programmer handy (you can also use GoodFET), I wired it up by following the diagram below and flashed the RFCat bin for the ez Chronos dongle using the SmartRF Flash Programmer tool. As the communication with the dongle was good, it was time to analyze the signal sent by the remote and write some code to replay it using RFCat. For the analysis part, I used the SDR# tool for Windows: tuned the right frequency (433.92MHz) and saved the signal into a Wav file for later analysis with Audacity. It's a fixed code and looks pretty straightforward: short and long pulses. We can estimate the length of each type by measuring the number of samples. In this case, short pulses took 3000 samples or 1200us (sample rate was 2.4Ms on SDRSharp). So, the final frame would make us rewrite the previous one changing every "1" bit by \xAA\xAA and every "0" bit by \x00\x00 to maintain the length of each bit (see code below). The duration of each bit is now about 80 us. 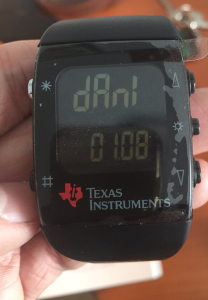 After building the code with Code Composer and loading it into the Watch with the JTAG included in the kit, a new menu is available and the signal's going to be sent every time we press the UP button. All the information in this blog is for educational purposes only. You shall not misuse the information to gain unauthorized access. A new cool gadget has fallen into my hands: a SDR DVB-T dongle based on the Realtek RTL2832U chipset. Little did I know I was gonna get so fascinated about this world and first thing I wanted to try is to open my garage door from an Arduino as a "Hello World" exercise. As long as the button's pressed, the remote will keep on transmitting the 18-bit frame which we have identified as: 00100011 00100011 11. This bitstream can be clearly seen on Audacity. 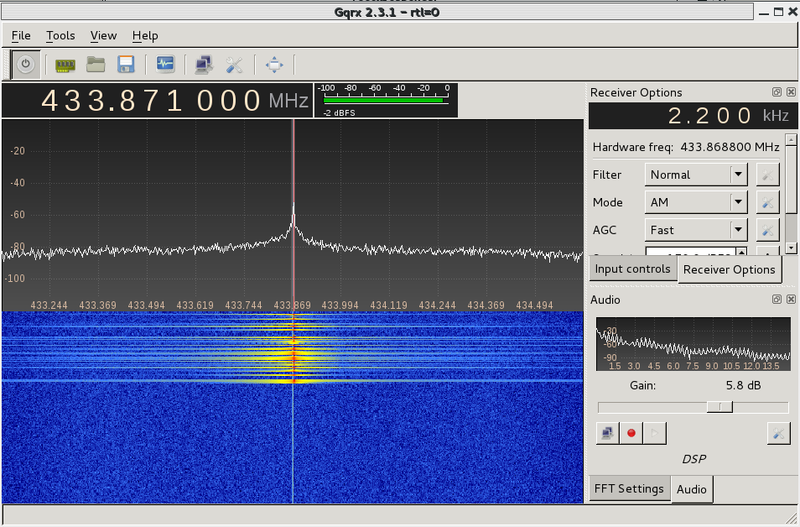 It is a very simple project but as a first contact with the RTL-SDR world I had a lot of fun. I'm looking forward to learning more about it, especially the gnuradio-companion software for signal processing and analysis. 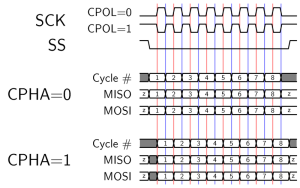 SPI (Serial Peripheral Interface) protocol is a synchronous serial data link which operates in full duplex mode. It's got a higher throughput compared to I2C or SMBus and it's very useful for high speed short-range communications. All lines can be shared for every slave device in the bus except the Slave Select signal which has to be different (out of band selection) for each slave. 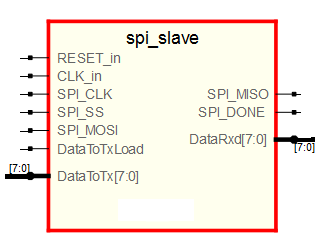 The SPI core I've implemented is fixed for Slave and CPOL=0/CPHA=0 modes. This means that the MOSI line will be sampled at every rising edge of the SPI Clock whilst the MISO signal will be set right before this rising edge (actually, on the falling edge) so that it can be properly sampled by the Master. 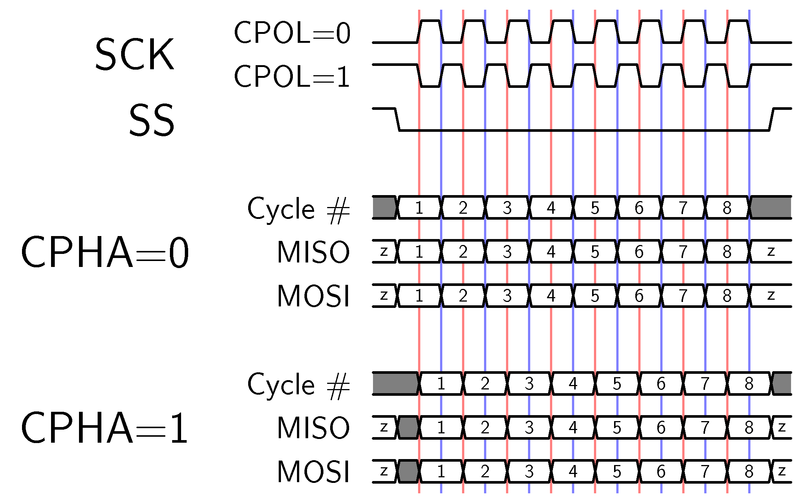 As the FPGA will have its own clock, we'll be having two different clock domains since the SPI master signals will be generated externally and they won't be necessarily synchronized to the FPGA internal clock. Thus, the approach will be sampling all the external signals to get them synchronized and using two shift registers for input and output data. As you can see, when the spi_done signal goes high, the datarxd register is loaded with the value 0xA0. Afterwards, the answer to this command (0xA4) is loaded into the datatoxload register and the MISO line is set to the right bit at every falling edge of the SPI clock signal. I configured the SPI bus to run at 2MHz on the microcontroller. Here you can see the logic analyzer output which shows that the SPI core works as expected. As you can see, the microcontroller sends a ping (0xA0 byte) and the FPGA answers with a response command (0xA4 byte). The SPI clock frequency is exactly 2.000MHz and the behavior is the expected one. I've started to build some sort of two-wheel Balancing Robot and before getting the party started I'm having to deal with mixing up the data gathered from my inertal sensors. My homebrew IMU (Inertial Measurement Unit) is composed by one 3-axis accelerometer and 1-axis gyroscope. 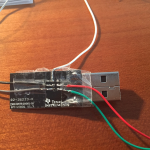 The gyro sensor's got an analog output (.67mV per degree/s) and the accelerometer's got an i2c interface. I would love to share its part number with you but, since I liked this unit to be as cheap as possible, the sensors were ripped out (and reverse-engineered with a logic analyzer) from a cheap PS3 gamepad bought on eBay ;). Since the output of the gyro sensor is 'too low' for my ADC, I built a simple non-inverter amplifier and a low pass filter with a cutoff frequency of 1KHz. Also I placed a high pass filter (cutoff frequency at .3Hz) in order to compensate the temperature drift. The data from the accelerometer's digitally filtered on the microcontroller with a simple 1st order Butterworth filter. 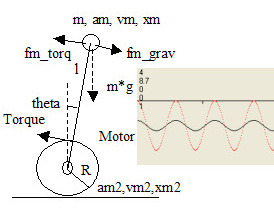 The main idea of this kind of robots (inverted pendulum) is to measure the tilt angle in order to drive the wheels just below the mass. The higher the center of gravity, the easier balancing will be. 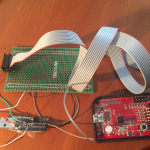 Why do we need both an accelerometer and a gyro? - The acclerometer senses not only the gravity (tilt) but the acceleration forces on its axis. So it would be useful if it was static (no acceleration due to movement). - The gyro outputs angular velocity (degrees per second) and it's not sensitive to acceleration. In order to get the angular position we have to integrate this signal. However this will drift over the time and the estimated tilt angle wouldn't be accurate after some seconds. The 'trick' is to take out the best of each sensor: the long-term information from the accelerometer and the short-term response from the gyro sensor. One way to do this is using a 'black-box' known as Kalman Filter (if you are brave enough, have a look at the theory; I'm not :)) which mixes up both signals predicting the actual tilt angle. I got some source code of this filter from rotomotion (http://scratchpad.wikia.com/wiki/RotomotionCode) and pushed it directly onto my microcontroller. The sensors are sampled at 50Hz and fed to the KF at the same rate. In the next plot you can see the raw tilt angle (atan2(raw_accy, raw_accx)), the integral of the gyro sensor (using the trapezoidal rule) and the output of the Kalman Filter. As you can see, the raw tilt angle is a little bit noisy while the gyro integration is very clean. Also, there's a lot of drift in this signal but magically the KF manages to estimate the angle very accuratelly and free of noise. I 'll post more on this soon! I'm working on a project which involves an i2c communication between a master and some slaves. The master device is using an LPC2148 microcontroller running at 60 MHz and the slave ones have a low-cost PIC microcontroller. Each slave device runs a different task and some of them are more CPU-intensive than others. 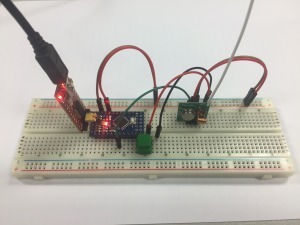 The nature of this i2c communication is essentially some kind of Query-Response protocol in which the master requests some processing from the slaves and they send back the results to the master. The processing time varies from one slave to another and sometimes it will be higher than the master 'clock' time. This leaded me to find a way to stop the master until the slave is done with its processing: clock stretching. The slave will pull the clock line down, causing the master to stop until it's done with its task and then releases the SCL line (going high due to the required pull-ups of the i2c signals). Please, note that the values defined for SSPCON register / bits are for PIC16F677 microcontroller and it might differ from the one you're using. 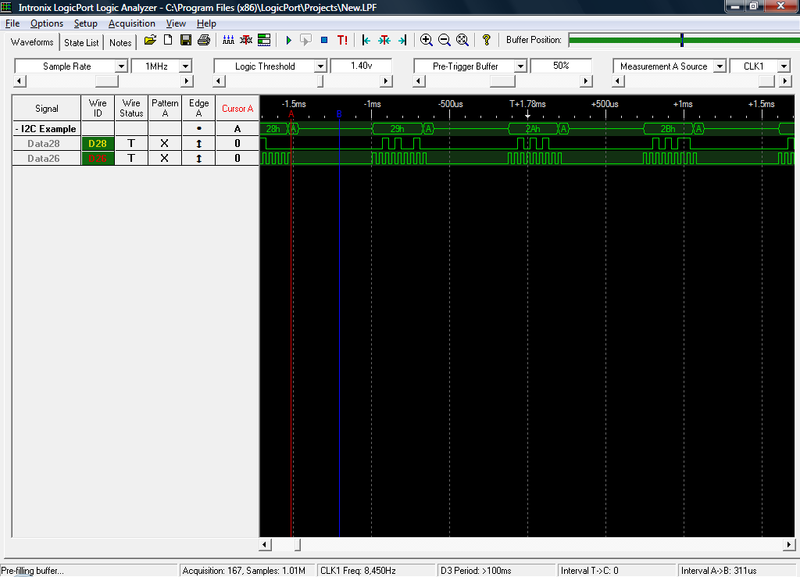 Below you can see an screenshot of the Logic Analyzer output I used for testing purposes. You can see the 400 us delay between two consecutive readings from the master while the SCL line remains low. All in all, it's a well known technique described in the protocol specification but as far as I'm concerned by googling a little bit, its usage is not very extended and there are not so much source code out there addressing this issue. RL-AMC-50NP04 is an advanced Full H-Bridge board based on high performance MOSFETs capable of driving two high power DC motors. It has been designed to achieve a great efficiency and usage simplicity since just 3 pins are needed to control a motor. Based on the large experience working with Robotics we designed this board keeping in mind some important factors such as power dissipation, heating, simplicity and functionalities like braking, bi-directional control of the motors and a wide range of PWM frequencies from 3.3v or 5V microcontrollers. Its small size makes this H-Bridge MOSFET board perfect to fit in your Robotics designs: 50 x 42 mm (1,97 x 1,65 inch) . 2 high power DC Motors control. PWM frequencies up to 20 KHz for speed control. Braking function (coast and brake functions). 3.3v / 5V logic capable. Up to 8A continuous operation with very low internal resistance (0.038 ohms). Up to 35A pulsed current. Wide range of power supply voltage ranging from 3 to 40V. Current sense (just 6mV per amp to minimize the total voltage drop when high currents are demanded). Just 3 pins needed from your microcontroller to drive each motor. Two LEDs per leg indicating the rotating direction of each motor. Easy interface connections through an standard 10-pin male header. Three two-pin terminal blocks for connecting the motors and their power supply. Logic power supply ranging from 2V to 6V. Here you can see the output of the board when driving one of its LEDs with a voltage supply of 8,4V. The voltage drop accross the LED is about 1 Volt and in this graphic you can appreciate that the rising and falling times are extremely small since it has been designed for operating in high-speed environments with the maximum efficiency. This minimizes the transition time of the MOSFETs (time when their internal Rds resistance is higher) and, thus, also minimizes the total power dissipation due to switching power losses. If you are interested in this board or have any further questions / suggestions don't hesitate to contact me. The X-PIC Development System was designed by my colleague and friend Alberto Calvo and me during our studies at University. 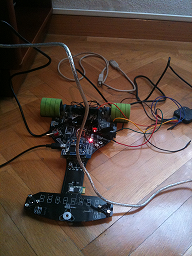 It is composed of two main boards: X-PIC and X-BOT which I will describe briefly. 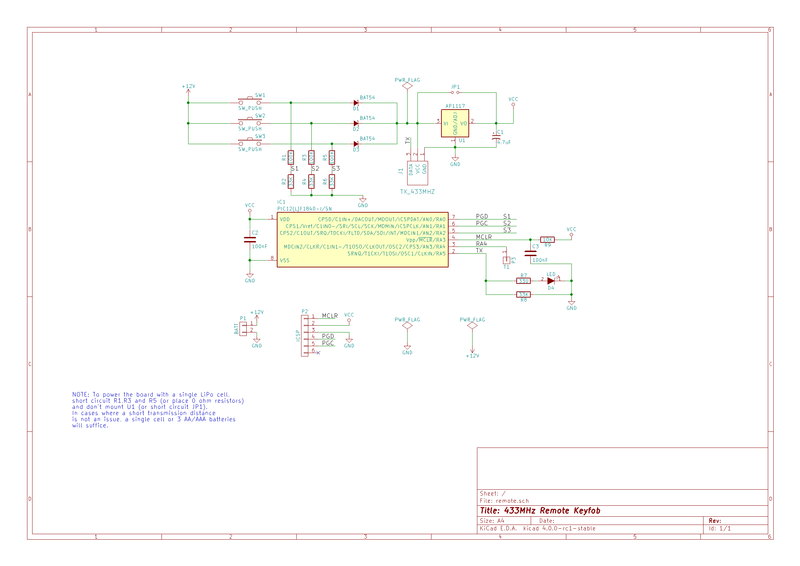 Our goal was to design a microcontroller based system powerful enough for our Robotics projects. However, we realized that it could be a good idea to design a more generic system which could be used as a small development platform without the need to have a big amount of LED's, buttons, LCD, switches, jumpers, etc. as most boards use to have. 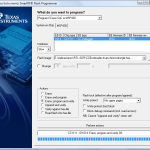 So it is suitable for any projects which require a microcontroller. This is the main board. It has got a PIC16F877A microcontroller at a clock frequency of 20MHz. There's also an EEPROM serial memory which can be interfaced both externally and through the microcontroller. All the GPIO pins can be easily accessed through the 10-Pin connectors, all of them including VCC and GND signals. For testing purposes, the board's got a general purpose button and one LED. 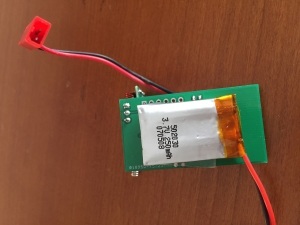 It can be programmed through its ICSP connector or through its RS232 interface if a bootloader is previously loaded into its internal Flash memory. This board was designed specifically for Robotics applications and can be easily connected to the X-PIC board and mounted together. It's got eight connectors which allow the microcontroller to read their value through selectable digital or analog IO pins. 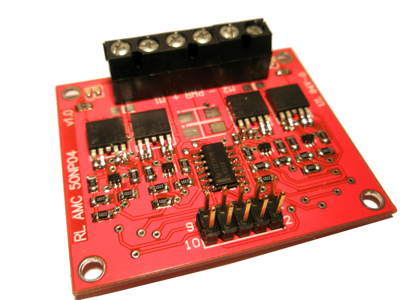 Also it includes two DC Motor drivers to drive up to 4 motors (1A per channel) which make this board suitable for a huge number of Robotics and Electronics applications. As an extension to this system we designed the X-TRK sensor board specially aimed to Sniffer Robots. It can drive up to 8 IR sensors with just 4 IO pins thanks to its 3 to 8 line decoder. In the picture you can see a 3D version of the board, which has not been yet manufactured (just two home-made protoypes).